Power for the road: Stay independent with portable solar panels. On expedition, hiking, a camping holiday or wherever there's no reliable power source, then solar panels are a practical solution. With these, you can charge camera equipment, satellite telephones and more at base camp. The main equipment remains functional and a basic supply is guaranteed on the move. A portable solar panel for hiking and trekking is small, flexible and also collapsible. These are comparably small and can be fixed onto the backpack for the whole day. For professional film productions, where you want to start editing on location, there are robust solar modules and panels with high wattage and therefore greater efficiency. 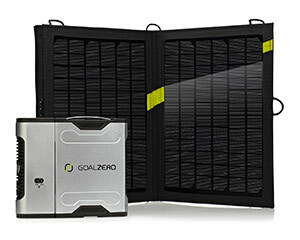 Goal Zero, Brunton and Sunpower have practical, mobile solutions for every application. Portable solar panels with USB port are ideal for charging small electronic devices such as a smartphone or camera directly, without the need for a heavy rechargeable battery. A great item for hiking and day touring! The performance of the panels and thus the charging time for the battery is directly related to the intensity of solar radiation. If you'll be in the wilderness for longer, then a larger solar module can use the hours of sunshine connected to a battery. So during the day, the power supply is backed up to the charger. So it's worth getting a second battery for the most important devices for longer trips. One rechargeable battery always stays on the charging dock, whilst the other remains in the unit.